A smattering of hints, tips and musings about what to consider if you should find yourself thrown into the Duat. When I was dumped into wherever I was for this year’s Mysteries, I was given no information. In fact, the whole process was rather unceremonious. Wpwt struck the sky with his staff, a hole opened up between us, and I got thrown down into the hole. By the time I hit the ground, I found that there was another person with me, and that the world around me was a bland mix of black, grey and beige. To the best of my knowledge, I was thrown into Rosetjau- the place of towing. All in all, Rosetjau is not a very great place to be. Most of the accounts regard it as being arid, dry, and desolate. And if Rosetjau is where I ended up- those accounts are accurate. When I fell into the Duat, I must not have landed where I needed to be, because someone dragged me and my companion to a gate while we slept (literally). I woke up strapped to some sort of sled being led by I don’t even know who. And when we were finally thrown out onto the sand, it was in front of a huge pylon and wall. Beyond the gate I found sand. Lots and lots of sand. But not all of the sand was the same. The first stretch of sand reminded me of an ocean. 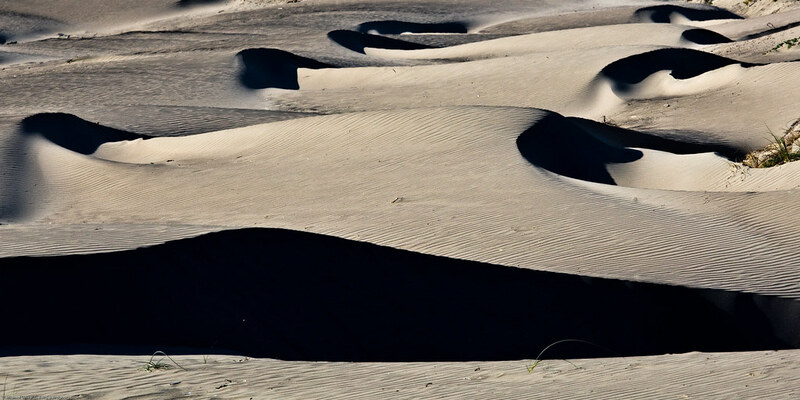 The dunes were not very deep, but the sand felt like it was always shifting and moving- like water. Beyond that, we had to cross a dried out flat area with huge cracks in the ground. And the third section of sand I crossed was filled with deep dunes that were ridden with weird… sand creature things. So the first tip I can give you is: not all sand is created equal. Some sand is easier to navigate than others. Some sand houses creepy crawlies. Some doesn’t. Always be careful when you reach a new stretch of terrain because who knows what is going on beneath the surface. The whole time I was “above ground” in the Duat, the sky was black. There were no stars, there was no light. You could see, but at the same time, it was like the sky was a void. The whole place was very quiet, and sometimes the only sound you’d hear is the wind blowing (which it often did during the ‘sand ocean’ part). For whatever reason, I found that many of my non-physical abilities were stripped from me upon arrival in the Duat. I don’t know if this is a reflection of the type of plane that Rosetjau resides in, or if this was some added bonus on Osiris’ part, but either way- be prepared to travel old school. Be ready to walk a lot. And be ready to get tired a lot. There were many times when we would only get a couple hundred feet before we found that we were exhausted and had to sit down. It was very very very slow going. If you have any time to prepare before you get thrown into the Duat, learn how to build some type of sled with a sail, and learn how to create wind. I found that this cut some of our travel time down, though it took a lot of energy to fuel the wind that would propel us forward. Additionally, learn how to ward yourself up properly before you get too far in. Wards are a good safety net to have while you’re sleeping- because sometimes weird stuff shows up when it thinks you’re not awake and are vulnerable. If you’ve got anything on your person that the NTRW have given you- keep that with you. When I needed to prove who I was, or the validity of me being in the Duat, I’d pull out some of the items Osiris and Set have given me, and more or less used their authority to give myself authority. “They say I am allowed here, and I am here under their direct orders, so step aside”. While I don’t necessarily consider it to be part of navigating, I would highly recommend you learn how to make food of some kind. I found that giving out chocolate and beer worked really well for making friends at the various gates I’d run into. I paid the entity that dragged me and my friend to the gate with gold coins. I paid the bouncers at the pylon in chocolate for showing me which direction to walk in. I gave the small group of people I met at the entrance underground flowers and beer. I bribed a netjeri into carrying me across the desert by feeding it. Offerings and “stuff” can get you further and ease the minds of those you run into. One of the first things I worried about when I entered the Duat was my heka. Most people say that you need a Book of the Dead in order to navigate the Duat because you need to know all of the random stuff and the proper words to open the gates and avoid trouble. While that may be the case for some places- that was not the case for where I navigated. That’s not to say that your heka and verbage was not important- but using words from antiquity was not necessary. Every interaction I had, I chose my words carefully. I made sure to use words in the present tense, and I chose sentence structure that made the world around me conform to my will. For example, I had this weird… wall statue? head? thing? ask me where I was going and what I wanted. I told this entity that I was moving where Osiris commanded me to go, and that that he was obligated to open the door in front of me that prohibited me from moving forward. Everything I spoke was confident and allowed no room for weaseling out of what I wanted. If and when you need to talk with others, don’t be afraid to take a few moments to get your wording down, and try to block any doubts from your mind when you begin to speak. This seemed to work well for me and I didn’t need to worry about how it would have been said in the old days. I would also suggest sticking to being as polite as possible while still being authoritative. Don’t go around making unneeded enemies. Sometimes the strangest entities can help you out. If you find yourself in Rosetjau (or possibly any area of the Duat), don’t get alarmed if the accounts don’t entirely line up. It seems that the terrain changes regularly- and I’m pretty sure that there have been shifts in population and landmarks since ancient times. I also found that the geography of the area made little sense. I expected to travel linearly- across the sand to the lake of fire, and then possibly down under the lake of fire to Osiris’ khat- but that didn’t happen in any respect at all. Sometimes down is up and up is down, and nothing necessarily makes sense on a map. I would also advise you to try and find something to use as a compass for navigating- if you don’t have a guide on you. I ended up using the sword Osiris gave me as a means to figure out where I needed to go- but that involved knowing how to trace threads and such. If at all possible, try to secure a guide for your trip- it will make it much easier. If you can’t get a guide, try to befriend or bribe a netjeri to help you out- my netjeri certainly knew a thing or twelve about how to navigate the sands. My trip would have been much harder without him. And finally, one of the best things I can suggest to anyone who ends up in the Duat is to try and stay calm and move at a pace that is comfortable for you. Rushing along may not be the best answer, and freaking out may only make it worse for you. Try to keep your expectations very neutral because who knows who or what will show up there, and above all- good luck.